Totally, totally get it. My friends and I spend a lot of time complaining about this (because, I guess we’re not that busy). Meanwhile, my sister is one of those people who packs every spare minute of her weekend with nourishing tasks and social activities and feels abhorrently lazy and overwhelmed with guilt if she spends Sunday morning watching TV. It’s weird. I don’t get it. This is scenario is basically the rationale for TIND, actually! Things I’ll Never Do is my way of coming to terms with the fact that instead of grabbing life with both hands I’m really more the sort to pat in gently on the head and back away slowly. This post explains it, sort of. Kinda. I completely agree with this article 100%. As someone who grew up in the work-to-live environment of Spain, as opposed to the live-to-work mentality here, I was shocked at how stressful and packed people’s days were when I moved to the US. I feel like people here have forgotten life isn’t about being on a constant race to get things done, life is short enough as it is. I have several friends who’ve filled their days with underpaid work, volunteering, and numerous activities, all while taking college courses- which has had hugely detrimental effects on their health, both physical and emotional. We are human beings, not machines, we were given one life, and I’ll be damned if I’m not going to take the time to stop and stare and the sky while sipping on tea for a whole day if I damn well feel like it. This is so interesting! I had the same reaction, however my aversion to the word comes from feeling condescended when people ask what I am upto and they devalue what it is I am doing, by saying “so you’re keeping busy” as if what I’m doing is killing time. I’ve never used the term busy to describe my actions. I guess I have never until recently assigned any value to the word busy. Until that is, I noticed people using the term to devalue me, or how I spend my time. 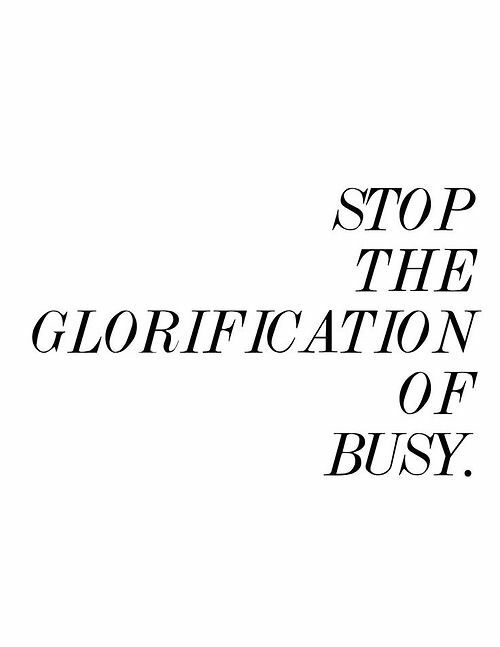 I think either way it is spun, keeping “busy” is nothing to glorify. Sometimes I do think on this. Are you less relevant, smart, significant, important, good or better because you are NOT busy? Sometimes, procrastination or even some time off is what people need. They may not have been workaholics true but neither have they degenerated to dope pushing or weird looking sloths/slouches/busybodies(pun-intended)/criminals. How can you construct a “busy” when you don’t have a “leisure” or even a gradient of “things to do”. In my blog before I did talk abut boredom and me not being integral. This has a lot of things to do with “busy” culture and also how many developing countries don’t have the concept of “leisure time spent” either. I may write a bit more in-depth on this but I am happy that this article does make sense.